All images were taken unbinned. Astrodon E-Series filters. Comet image guided with STL Remote on FSQ106 after changing the tracking in TheSky to the comet. Tracking was set back to stars to get the star field. Median combining removed most of the streaked stars in the comet image. 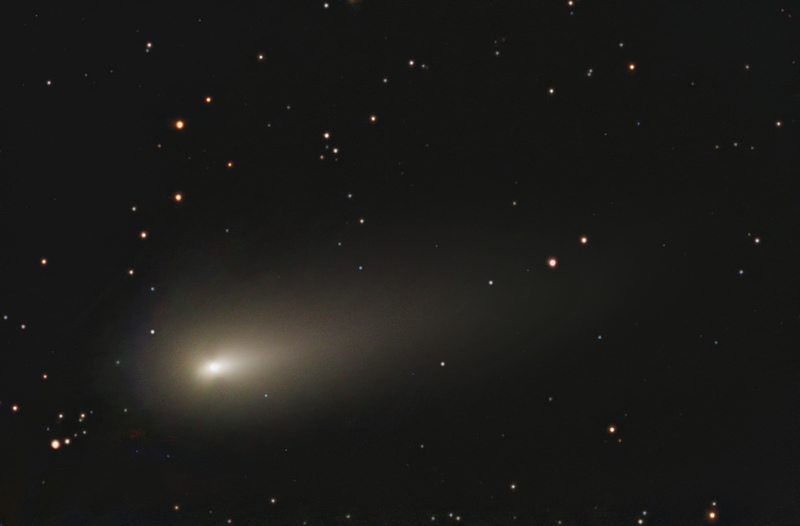 Calibration, registration (single point on the comet head), combining, including color combining were done in CCDStack. G2V star color weights were used in the color combines. The faint tracks that were left after combining the frames for the comet were eliminated in Photoshop using median filtering or gaussian blurring, excluding the comet. The comet had moved nearly out of the field when the star field was acquired, and any remains of the comet was cloned out in Photoshop. The location of the comet was just south of HER during data collection.